Focus is on Near Eastern information that puts Herodotus in a more balanced perspective. 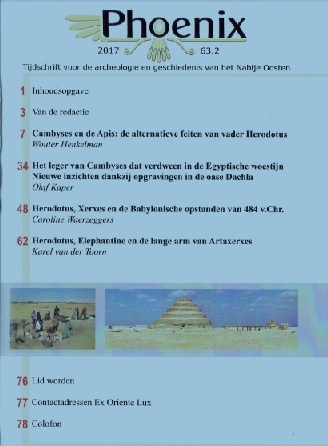 Wouter Henkelman presents Egyptological (and other) information on the famous story of Cambyses and the Apis (III 27-9; 33; 64). He shows how early researchers of the Apis burials were deceived by taking Herodotus’ story at face value. It is better not to, rather to consider Herodotus’ agenda of defamation of Cambyses, which Henkelman defines as ‘character assassination’. He places the story in an Egyptian tradition of defamation of foreigners, of ‘Chaosbeschreibung’. Olaf Kaper discusses the excavations in the Dakhlah oasis, which was once a settlement of revolting king Petubastis IV. The mysterious story of an army sent by Cambyses to the Ammonians, that disappeared in the desert (III 25), might well simply reflect an annihilation by that army by Petubastis, followed by a damnatio memoriae by the Persians. CAROLINE WAERZEGGERS discusses the modern prejudices on Xerxes, exemplified by the film ‘300’. Western knowledge and interpretation of Xerxes is based on Herodotus, who has a very biased picture of Xerxes. Herodotus suggests to have visited Babylon, but who is not very reliable. He does not know anything about an important revolt in the second year of Xerxes’ reign, i.e. about the year of birth of Herodotus. Karel van der Toorn discusses ‘the long arm of Artaxerxes II’ by recognizing the Jewish community in Elephantine in Egypt, which caused tensions. In the fifth century, the time of Herodotus, this setting apart of the Jewish community was not yet so much clear, so that for Herodotus the Jews (in Elephantine and in Palestine” simply counted as “Syrians” (all spoke Aramaic).